I started the pattern in single crochet only to find that my gauge was terrible and I really hated the way the color changes worked. I tried to carry the unused colors across the back or crochet over them like I had done in other projects. Unfortunately, that left loops and bulges, which meant I would have to line it. I also hated the confusion of reading one line of the graph going in one direction and then reversing it for the next row. I must have frogged that afghan at least three times before I finally decided to give the afghan stitch a try. I don't know how to cross-stitch, so I decided to learn how to change colors within the stitch. The really nice thing about this method is that you always read the graph from right to left, so it was very easy to keep track of my place. I also found that it worked up faster for me than the single crochet did, and it makes a much more solid picture than you get with cross-stitching. 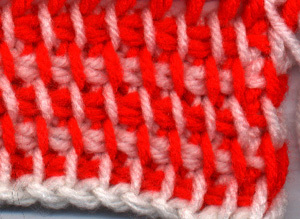 This tutorial was NOT meant to teach you how to crochet or how to do the basic tunisian (afghan) stitch. More than two, add yarn new. Carry is best for two or less. Also, I never carry yarn up and across a row I don't need it on. I know this makes for more ends to weave, but I think it's better to weave an extra tail or two than have yarn criss-crossing itself across the back of a piece. The more times you carry yarn in afghan stitch, the more loops you leave that could be snagged or worse. And in afghan stitch, I have not found a way to "crochet over" the loose yarn as you can with other stitches. The "hidden" tails will be very secure if you follow my guidelines in the section Weaving Ends. When translating colors in a graph to the actual crocheted piece, it helps to think of each stitch in your work as a block on the diagram. So if the 4th block on the graph indicates a color change, then you will change the color of the 4th stitch. Stitches are made in the vertical bars, so to change the color of the 4th stitch, you would change the color of the 4th vertical bar. 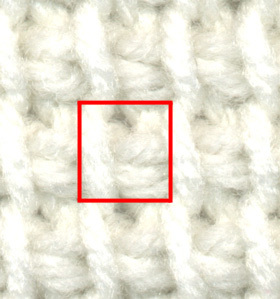 Do not count the starting loop of each row (see Counting Stitches). 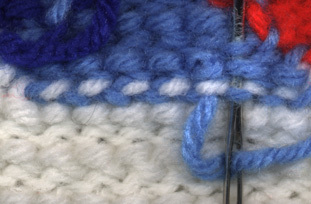 To start a new color, simply drop the old color behind your work and pull up a loop in the next stitch. 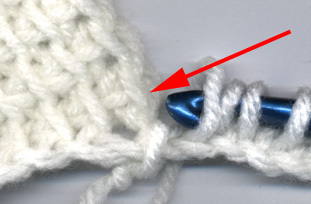 There is no need to make a slip knot to secure the yarn, just leave the tail hanging down the back of your work. Continue pulling up loops of the new color until the next color change or the end of the row. For the return half of the row, see below. Picking up a previously used color is quite simple also. To keep the stitches from gapping apart at a color change, the old color must be secured. To do this, pull the old color across the back of the next stitch and pull the new color up over it. 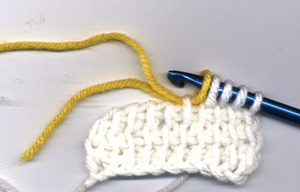 Then insert the hook in the next stitch and draw up a loop of the new color. Once you have drawn up the first loop of the new color, you can let the old color fall to the back of your work. The return half of the row is equally simple. 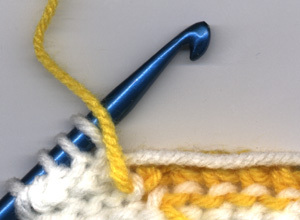 The second loop on the hook will always indicate the next color to be drawn through. 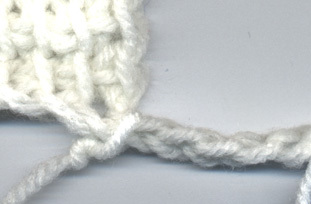 As before, you will need to cross the two yarns to prevent gapping. 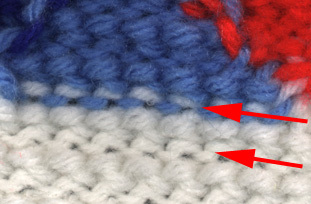 Pull the old color to the left, across the back of the next stitch. Pull up the new color over the old, locking the old color in place, and draw the new color through two loops on the hook. Once you have drawn the new color through, you can let the old color drop to the back of your work. My simple method of weaving in all those little ends makes it possible to change colors in the afghan stitch without the use of knots. The ends are quite secure and the weaving is almost invisible. Make sure to leave a 6 to 8 inch tail whenever you start or end new yarn. I generally use a metal or plastic yarn needle. On the back of your work, you can easily see where one row loops around another. I've used an area where two colors meet so you can easily see how the two rows loop around each other. These are the loops in which you will weave. Thread the needle and insert it into a nearby loop. 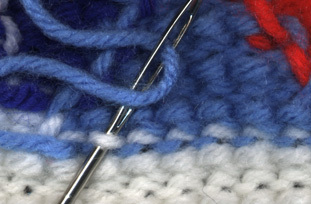 Be careful to choose a loop that is at least one stitch away from the loose end so that you do not unravel your work. I try to go "down" through the upper row of loops, and "up" through the lower row. 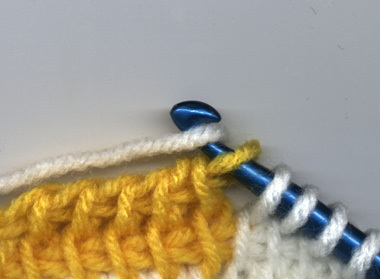 Pull the yarn securely, then go up through the next stitch. Continue in this manner for at least one inch. To turn and go back the other direction, simply go up through the closest loops above or below the current row and begin working in the opposite direction. Always make sure to weave the yarn only under the surface of the loops and NEVER through the entire stitch to the front of the work, as this would distort the stitches. I always try to weave a tail around stitches of its own color, but this is not necessary. As long as you do not go through to the front of the work, the weaving will be invisible to the front of the piece. Trial and error led me to develop this method of assembling panels and pieces. One of my afghan designs was wider than I could accommodate on a regular 14 inch afghan hook, so I decided to make it in three pieces. I tried several means of sewing the panels together, but none of them seemed to work the way I wanted them to. I finally settled on crocheting the second panel and attaching it to the first panel as I went. 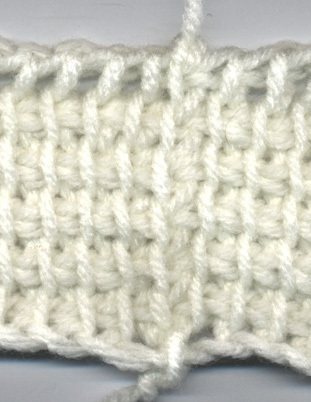 Join new yarn to the first piece with a slip stitch in the lower right corner. Chain the required number of stitches for the next panel. Draw up a loop in each chain across as usual. 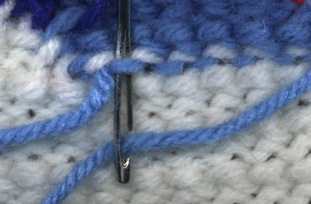 Insert hook in to the "V" of the outside stitch and through the stitch behind it. Here is the view from the front. 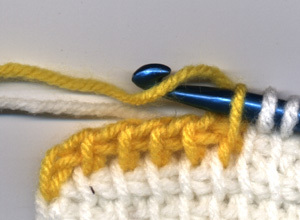 It is very important to go through both of these loops so that the front side will give the appearance of a normal stitch. Then simply yarn over and draw through a loop. Continue working the afghan stitch as normal, yarning over and drawing through two loops to the end of the row. When finished, the seam between the two pieces is would be virtually invisible to anyone but the most scrutinizing crocheter. There has been much debate about what constitutes a single "afghan stitch". 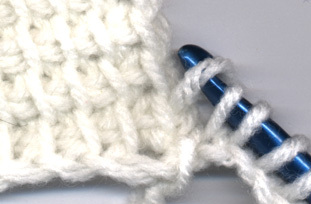 Some say that the LAST loop on the hook is not a stitch because you only draw through one loop to make it. 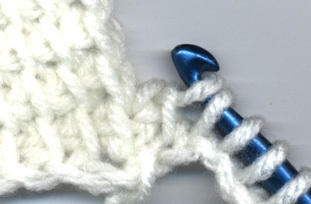 Others say that EVERY loop on the hook counts as a stitch. That was what I thought as well, until I started working in panels. Because of the way panels and color changes work, I have concluded that the vertical bar and the solid space to its RIGHT are what constitute a single stitch. 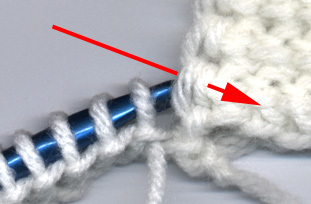 The last loop on the hook IS a stitch (because there is a solid space to its immediate right), but the first loop on the hook (which is left from the previous row) is not. Therefore, when following or charting graphs, keep in mind that the first loop on the hook does not count (unless otherwise specified in the pattern). Did you know that you can get a two-tone effect by using two different colors of yarn? 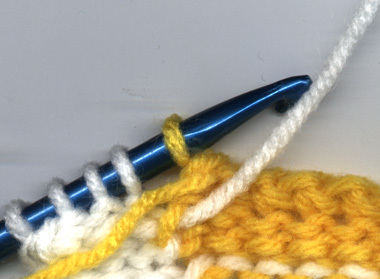 Chain the required number of stitches with color A and and work first half of row as normal. Drop color A and pick up color B and work the return half of the row. Continue by working the first half of the next row with color B. At the end of the row, drop color B and pick up color A. Repeat.